Ritha or Reetha (sapindus saponaria, family: sapindaceae) is a a medium-sized much branching tree attaining a height of 15 m. Its bark is dark with rough scales. The deciduous tree is originated from tropical America. 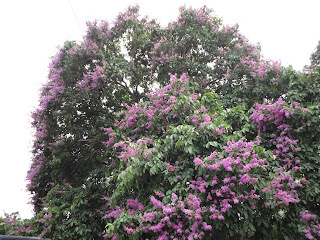 Nowadays it has been naturalized in Bangladesh as well as tropical areas of Asia. The good looking tree is found in the North-West region of the country. Leaves are green, 2-6 pairs per pinnae, 40 cm long, terminal leaf absent. Leaflets almost opposite or alternate, elliptic-lanceolate, 5-15 cm long and 3-6 cm wide, petioled, apex emarginate. After leaving all the leaves in the winter, new leaves arrives in the beginning of spring. Flowering occurs in the summer. Inflorescence up to 25 cm long. Flowers creamy white, tomentose. Petals 5. Fruit is drupe, solitary or pair, fleshy, subglobose, 1 cm in diameter, glabrous. Fruiting occurs in rainy season. The propagation of the plant is caused by seeds. Fibers on inner bark are used for making ropes. Fruits are used as a substitute for soap because of the high amount of saponin. The fruits are used in memory loss disease and breathing difficulties. Fruits are also used in fish poisoning. Seeds are formally used as buttons and beads. A kind of oil is extracted from the seeds too. In Sanskrit, it is called Arishta and Phenil.